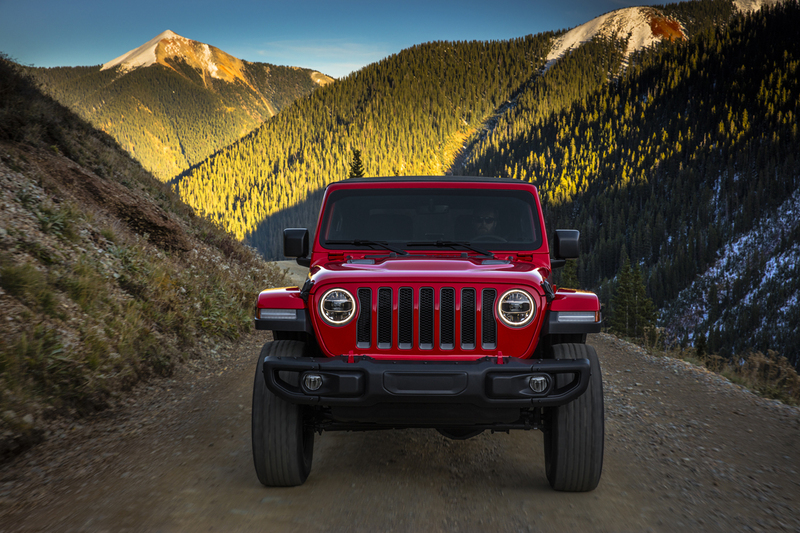 The biggest news to come out of this year’s LA Auto Show is without question the reveal and data download of the all-new next-generation 2018 JL Jeep Wranglers. Period. No apologies. 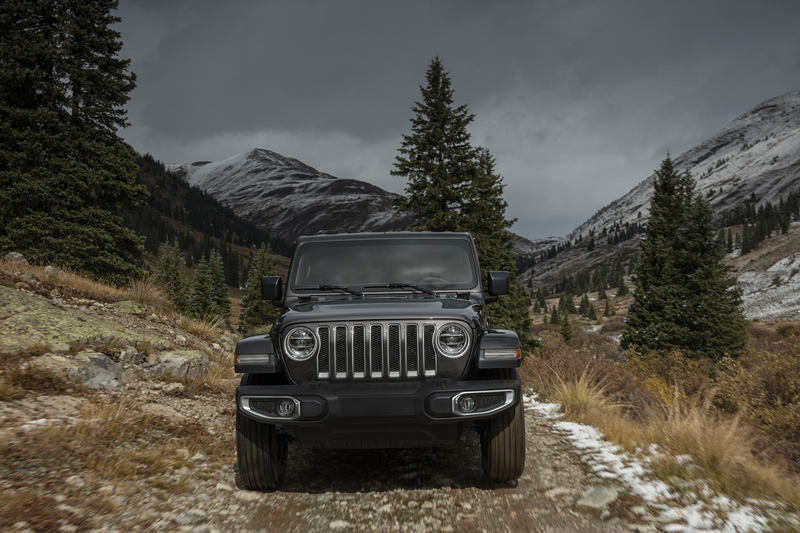 From a distance only a Jeep owner or enthusiast might notice the differences, but make no mistake the 2018 Jeep Wrangler is all-new from the ground up. Every nut and bolt, every bracket and hinge, every piece of sheet-metal and the guts themselves are all-new. At launch the JL will be offered in the short wheelbase 2-door and the longer 4-door in familiar trims Sport, Sport S, Rubicon and Sahara for the 4-door. While styling is evolutionary in every little detail, the overall design remains true to what we’ve come to know. 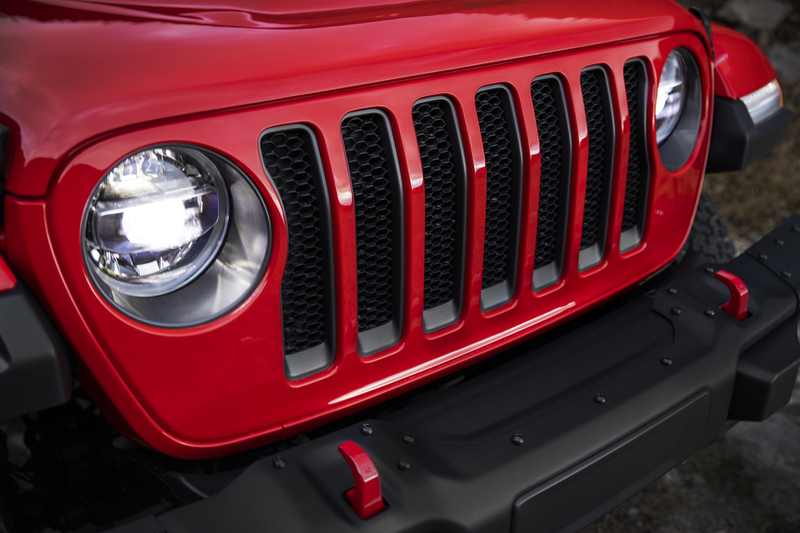 Design detail changes most notable are the curved grille that improves aerodynamics by some 9% were told, a grille with headlamps that set into the vertical bars a bit and available LED headlights. Rounder surface corners are pretty much everywhere so I’ll save us time and not point every one of them out, the pictures say it all. 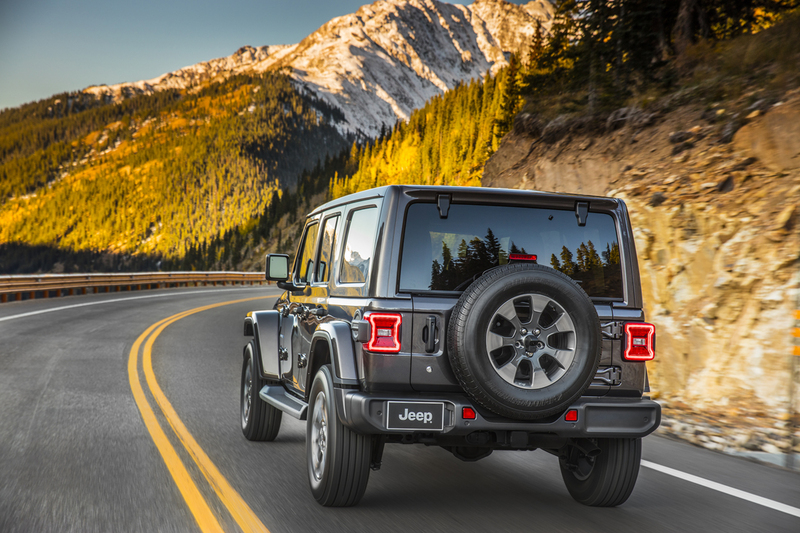 At the rear, a new take on tail lamp design is there, now available in LED. Side widow openings are lower for better visibility and contrary to rumor, the fold down windshield was saved, now easier than ever to use. 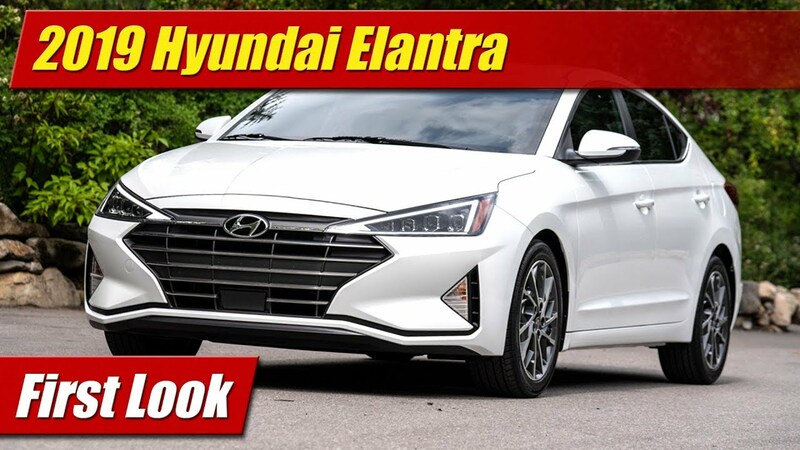 This was made possible by a fixed windshield header that remains in place and attached to standard body color sport bars on all models to retain body rigidity and help meet safety considerations. It does grow slightly in size, the wheelbase plus 1” on 2-door and 2” on 4-door, length 2” and 4” respectively. Overall width remains the same though the wheel track is 1” wider than before. 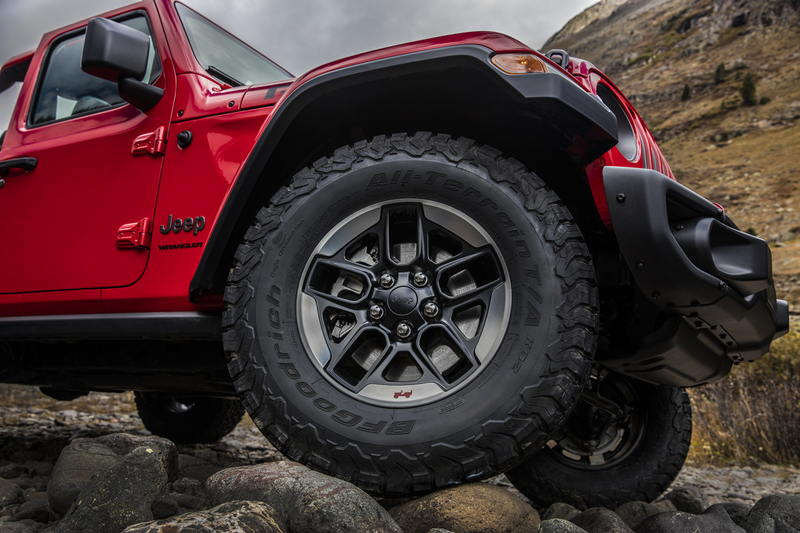 Ground clearance gets a major bump, especially on Sport with 1.5” additional at now 10” and the Rubicon sees nearly an extra inch at now 10.9” total. 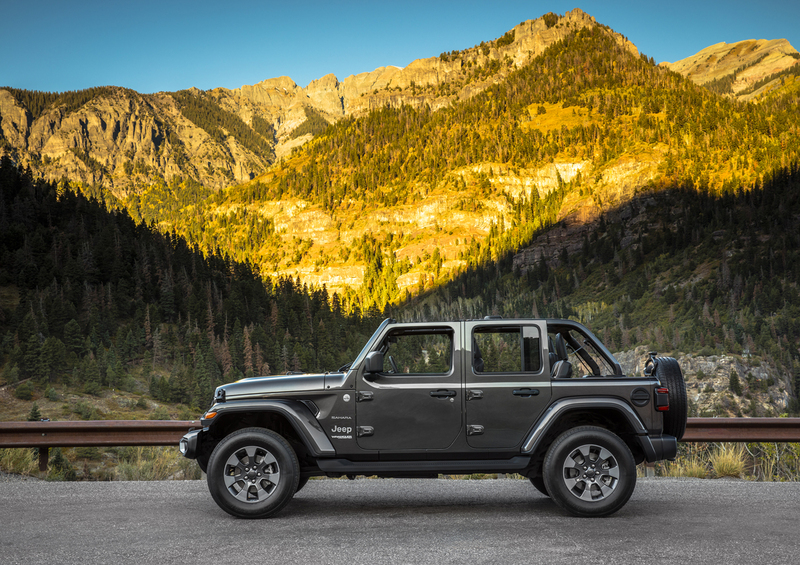 Though slightly larger, the JL has lost up to 200 pounds depending on the model with the use of aluminum in its removable doors, hood, hinges and a magnesium rear gate. 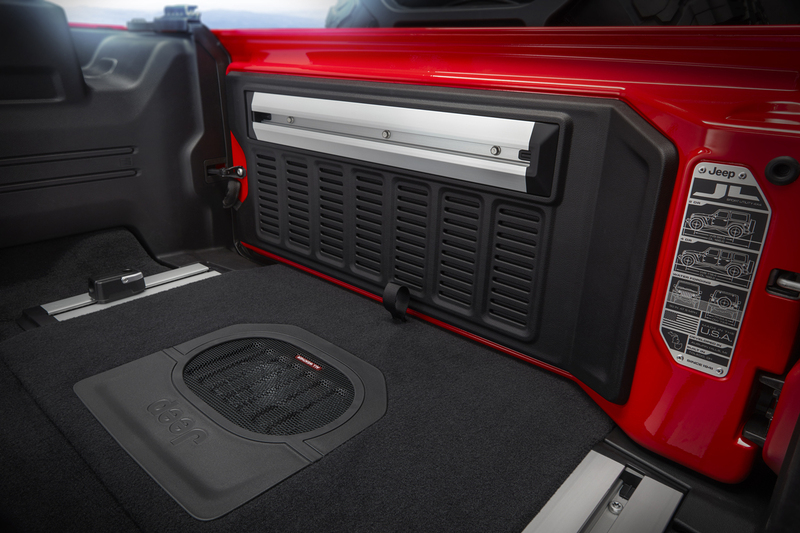 To open it up there are dozens of different door, top and windshield combinations allow for endless configuration possibilities. There’s even a new half-door design coming in 2019. New is a power operated canvas roll top option with the hard top that just rocks. 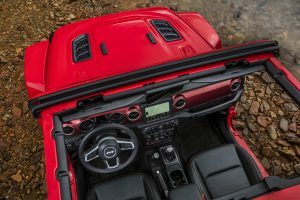 As before, the hardtops come in black or body color with multiple configurations to remove its individual panels, now with improved hinges for easier use. 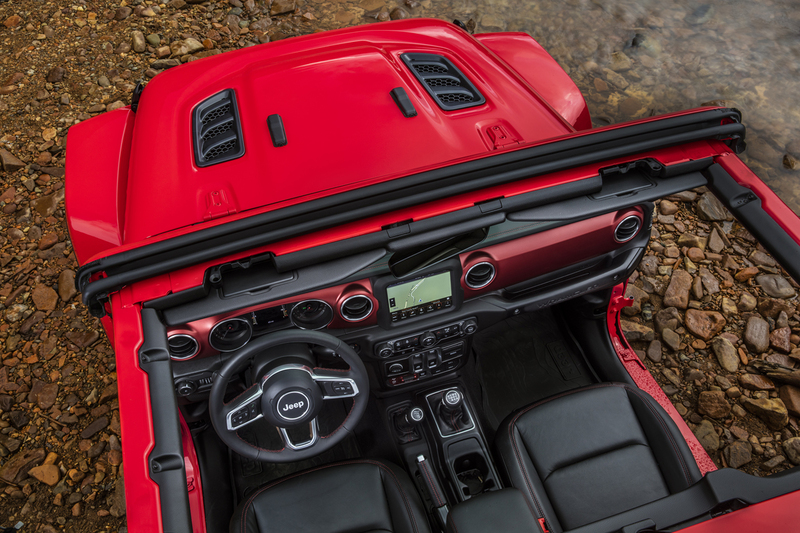 There’s also an improved Sunrider soft top with additional bows for better control of wind noise easier operation. 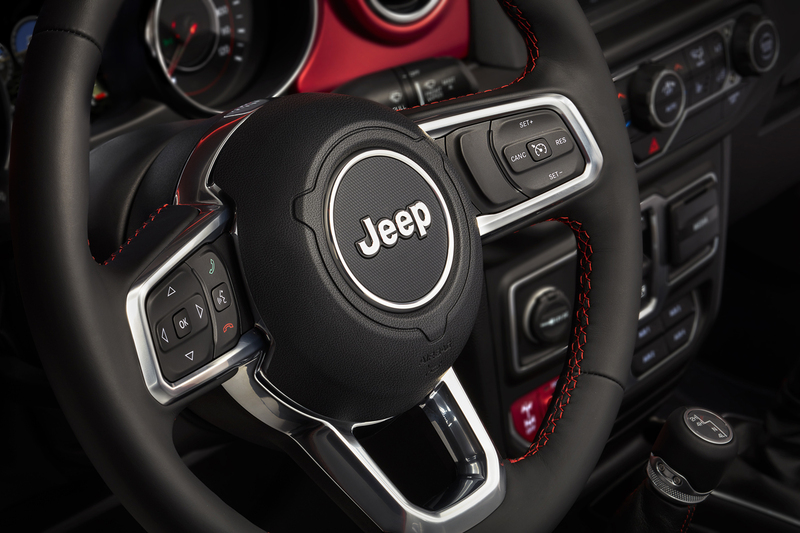 The interior is full of retro design touches and improved material quality in so many ways. Again letting the pictures tell most of the story here, the major bullet points are increased functionality from the technologies, more plugs and ports we expect today and better craftsmanship to hold it all together. Buttons, knobs and levers are manlier and more “built” in their design. There is now a push button start, available heated steering wheel and seats of both leather or cloth. 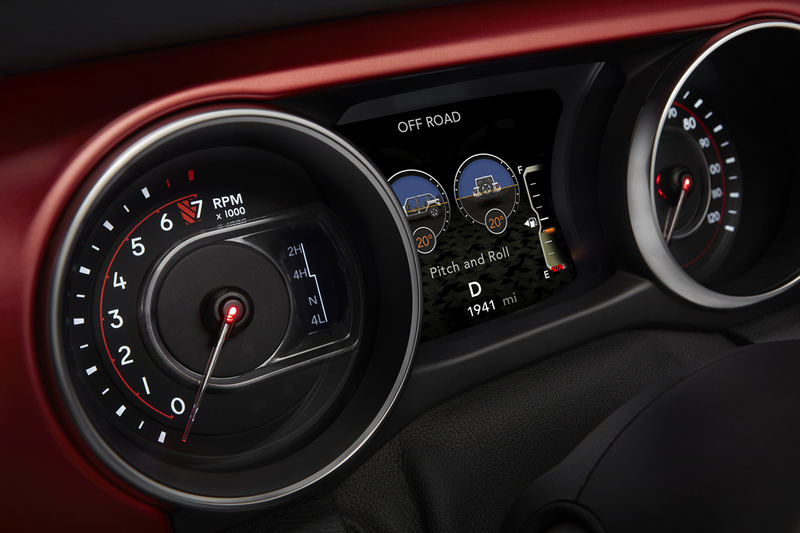 Ahead of the driver is an instrument cluster with either a 3.5” or full 7” TFT LED customizable information display. 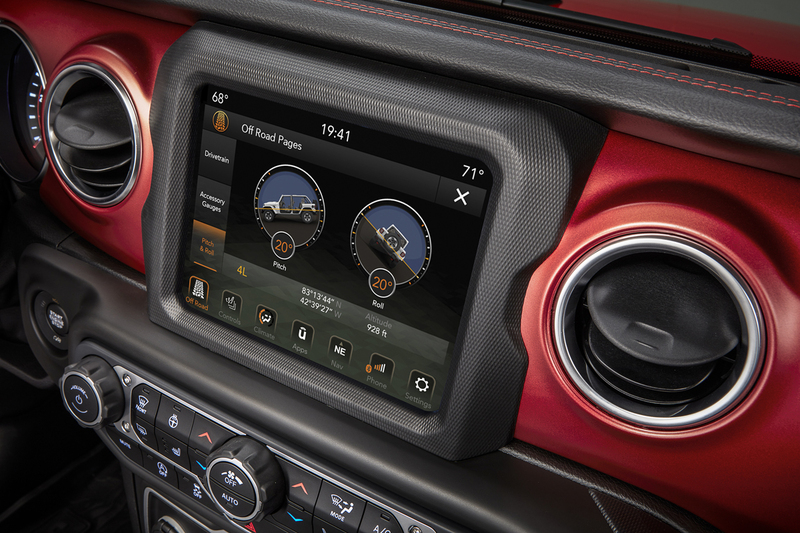 The center stack can be had with next generation Uconnect 7-inch or 8.4-inch touchscreens that operate faster and with better graphics. 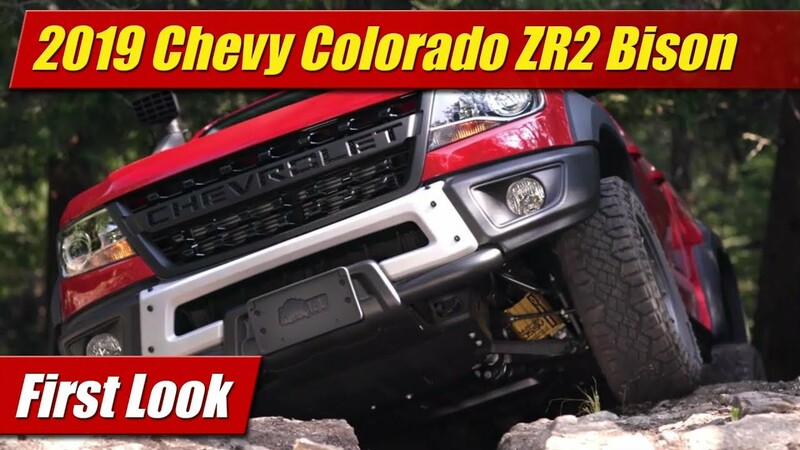 Expect more features like Apple CarPlay and Android auto and even some fantastic off-road pages to help you monitor your action out in the rock. 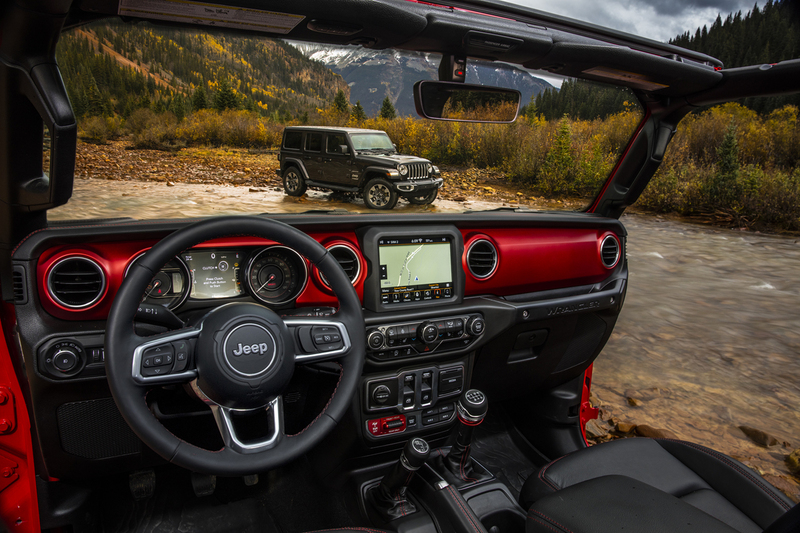 And out on the rock is what the new Wrangler remains about. An improved fully boxed frame is more rigid. Suspension remains comprised of live axles front and rear with the proven five-link coil suspension. 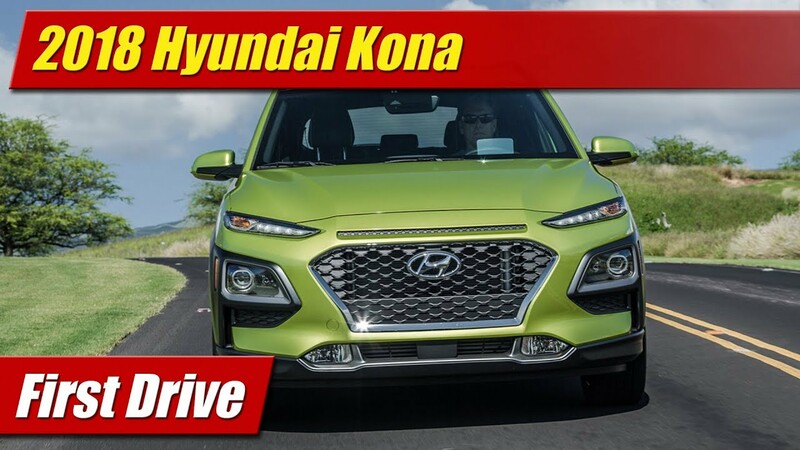 A new electro-hydraulic steering rack reduces engine drag like most of the new electric power steering but retains the feel enthusiasts want. 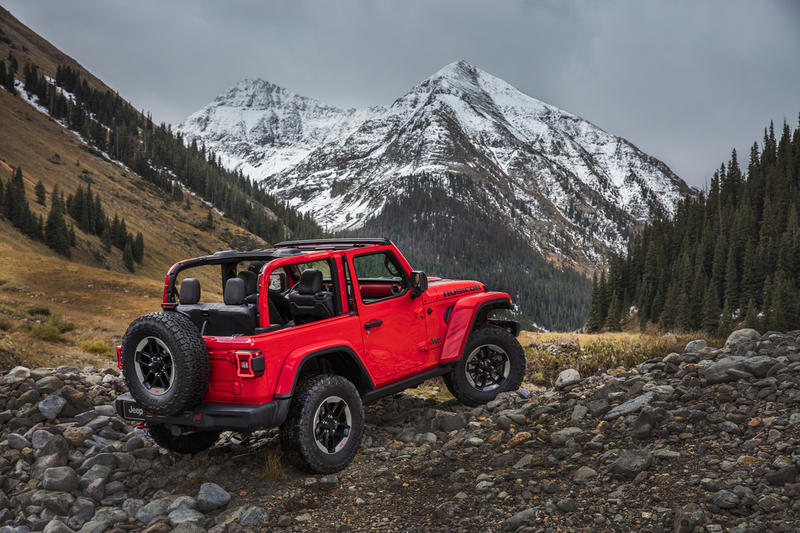 On Wrangler Rubicon the electronic front sway-bar disconnect allows additional wheel travel when needed. And to the numbers, the JL offers a best approach angle of 44 degrees, breakover angle of 27.8 degrees, departure angle of 37 degrees and a ground clearance of 10.9 inches allows Wrangler to go anywhere. It can ford water 30 inches deep and tow up to 3,500 pounds. 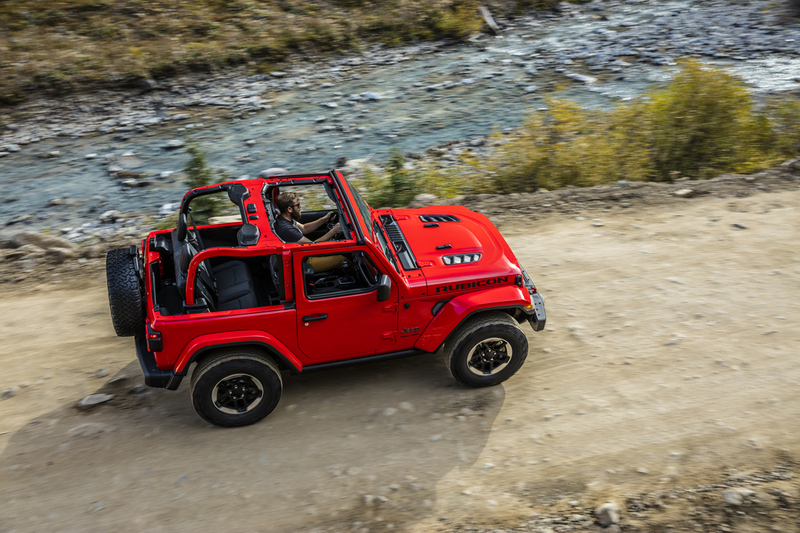 Two 4×4 systems are available, Command-Trac a two-speed transfer case has full-time four-wheel drive and a 2.72:1 low-range gear ratio available for the first time on Sahara. 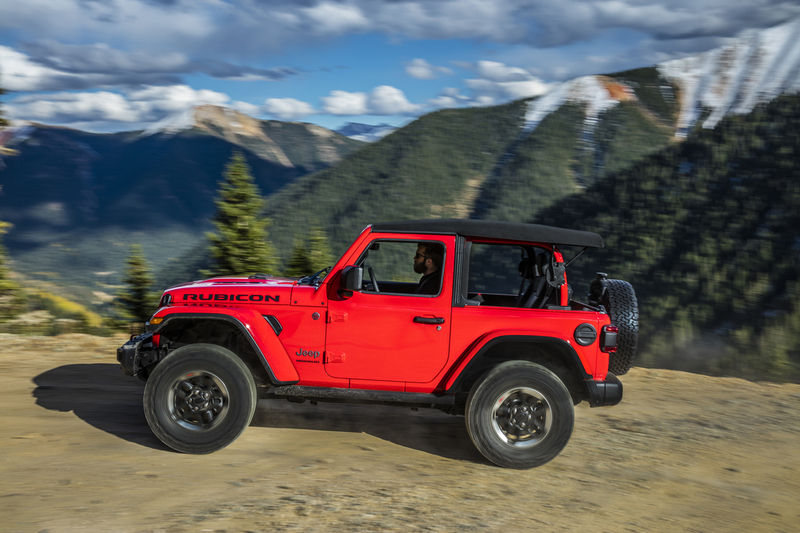 On Rubicon you get Rock-Trac with next-generation Dana 44 front and rear axles, a “4LO” ratio of 4:1, as well as front and rear Tru-Lok differentials. 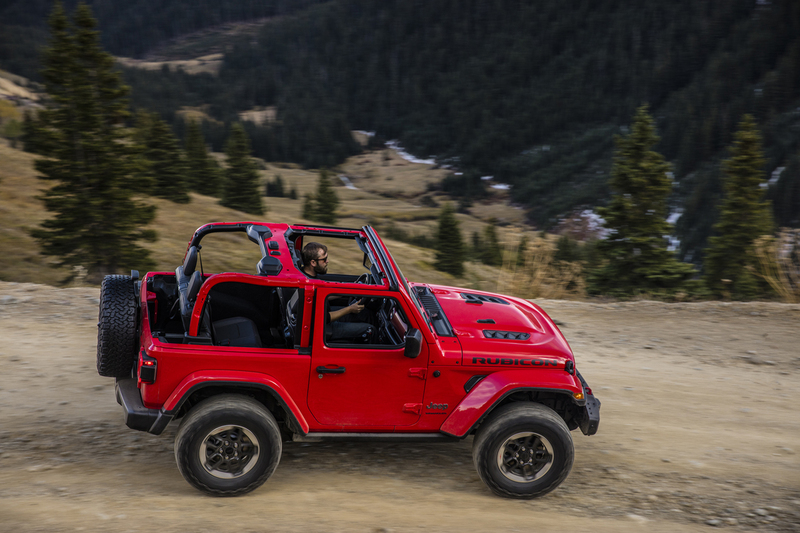 Rubicon has an improved best crawl ratio of 84.2:1 with manual transmission and 77.2:1 with the new eight-speed automatic. And that gets us to the new powertrains of which there will be four choices by next year. 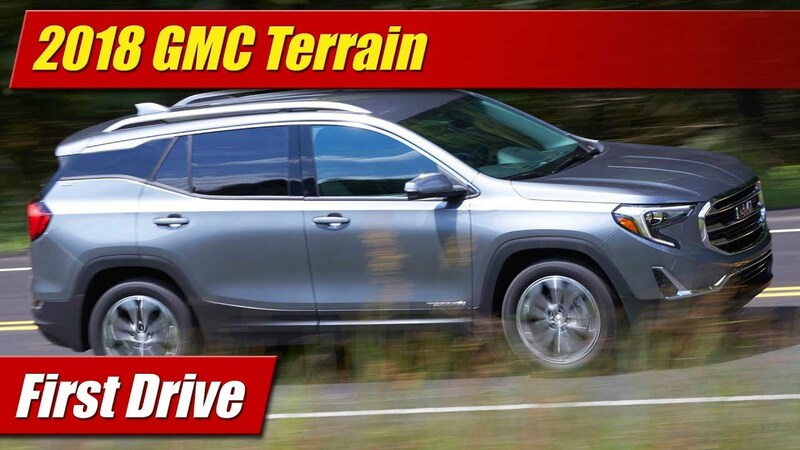 Standard on all models is the tried and true 3.6-liter Pentastar V6 with 285 horsepower and 260 pound-feet of torque, now with automatic engine stop-start standard. 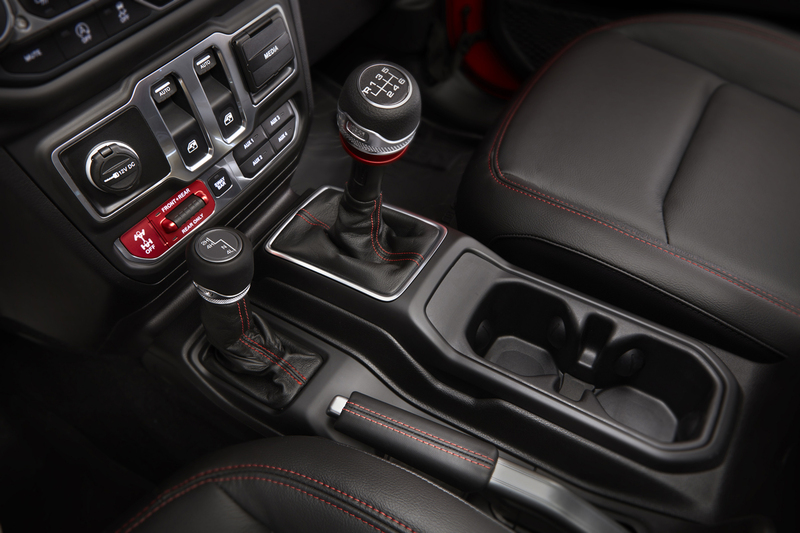 It comes with a standard six-speed manual with improved ratios and you can now option an eight-speed automatic transmission. 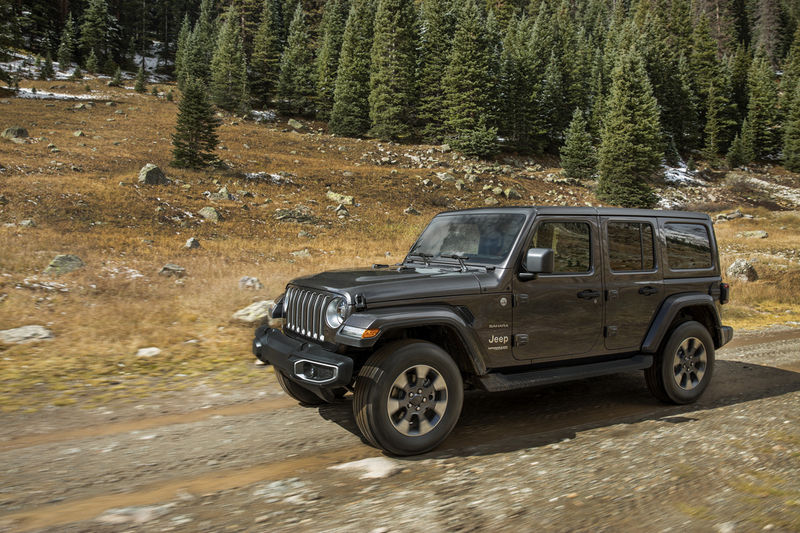 All-new for the JL is an optional 2.0-liter turbocharged four-cylinder with a mild-hybrid system called eTorque. 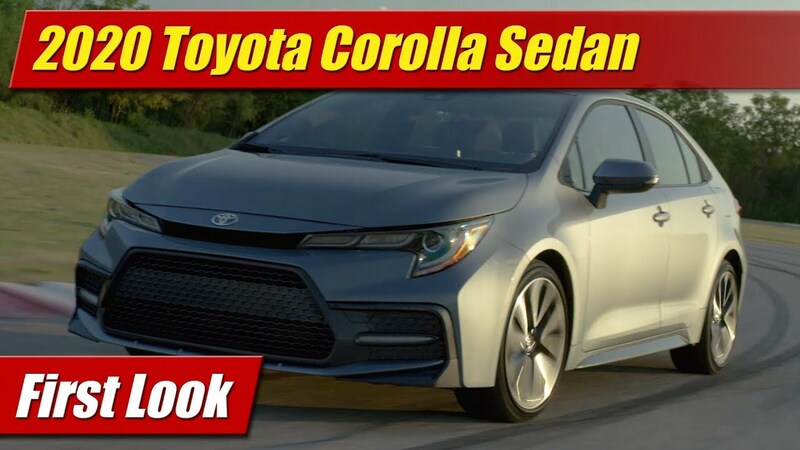 While that sounds lame, it offers up and impressive 270 horsepower and 295 pound-feet of torque – more than the 3.6-liter V6. 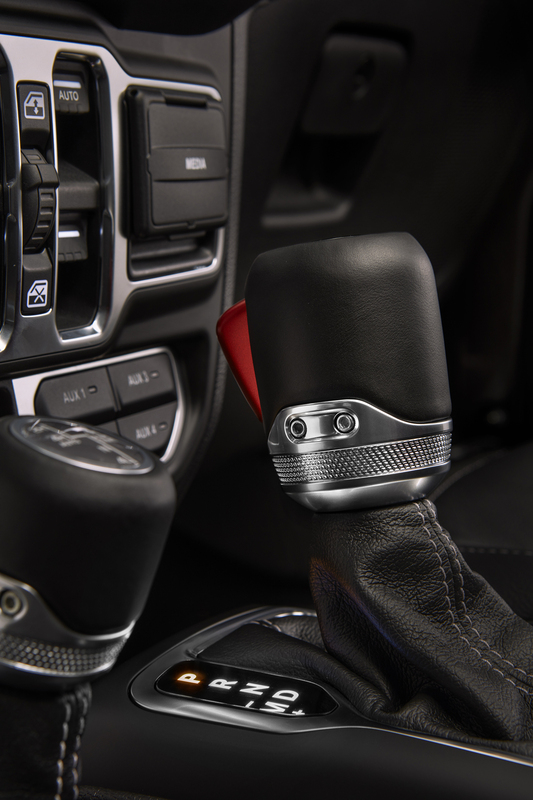 Mated only to the eight-speed automatic transmission, eTorque hybrid system helps power take off, coasting and smooths the transitions of the engine auto-start-stop operations. 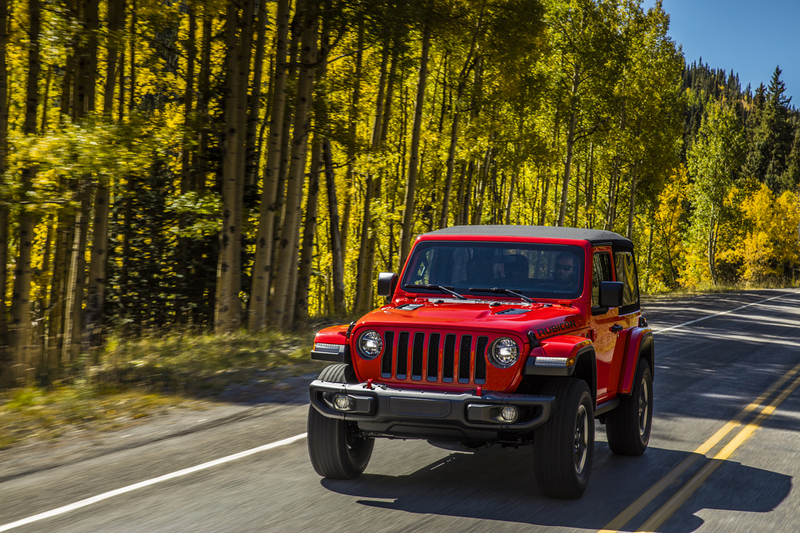 It also by the way improves fuel economy and will be available on all models including and up to 4-door Rubicon. The top engine will be the long awaited and my personal favorite, 3.0-liter EcoDiesel V6 with 260 horsepower and 442 pound-feet of torque. 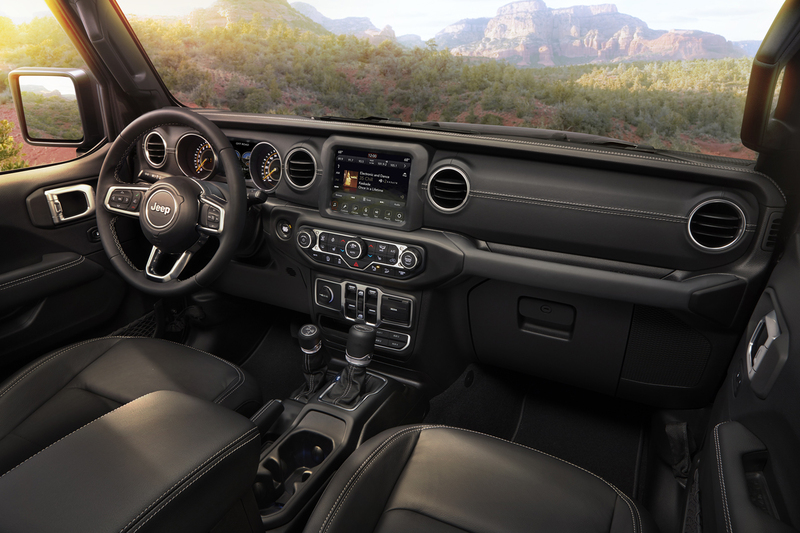 Mated only to the eight-speed automatic, the EcoDiesel will come only in Wrangler 4-door models and wont be available until 2019. The fourth powertrain option comes in 2020, a plug-in hybrid version with the 2.0-liter four-cylinder. 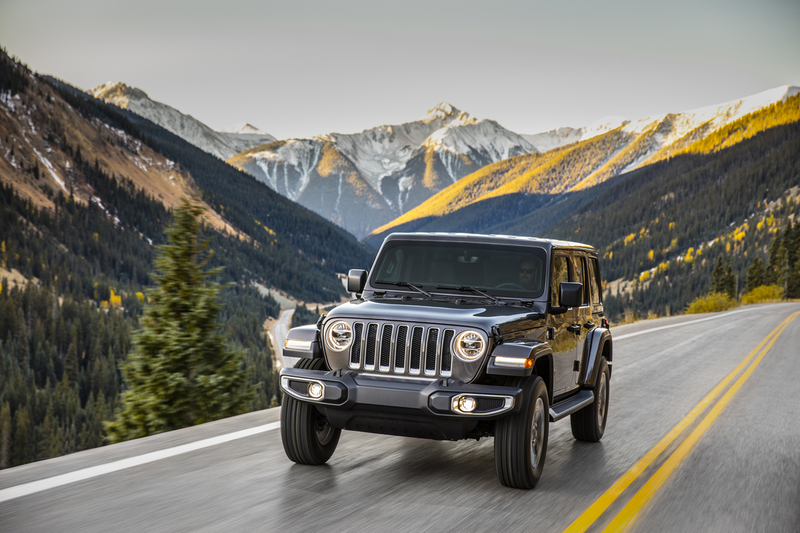 The all new 2018 JL Jeep Wranglers will begin showing up at dealerships early next year with pricing to be announced closer to launch. The JK Wrangler will also be available for an undetermined amount of time along side the new one.